I've been thinking a lot lately about Green Living ideas I want to share through my blog. I've got a list as long as my arm of things I think might be fun and interesting to write. So today I'm launching the first series in that long list: Green Money Saving Gift Giving Ideas. Although this series may have been more useful a month ago during the Christmas season, I think the ideas in this series will still be useful for other kinds of gift giving throughout the year. 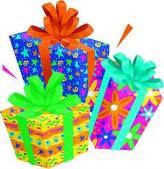 Each post will contain one or two ideas for green gifting. If you find you enjoy this kind of post please let me know so I'll know it's worth it to launch into the next series when it pops into my head. 1. Give an experience like a museum membership or theatre tickets Rather than contribute to consumerism and the production of more stuff, give an experience as a gift. Memberships to museums, tickets to a concert, play or to the movies, music lessons, cake decorating classes, wine tasting tours and many other experiences can be much more fun than any gifted item. With so many in the world in need of the basic necessities of life that we lucky ones take for granted, consider making a charitable donation with your gift giving dollars rather than buying more stuff that the recipient really doesn’t need or want. Most charitable organizations will either mail a card to the “In honor of:” person telling them about the donation or allow you to print your own from their website and personalize as you wish. I often print a few more fact pages from the organization’s website to give the recipient more information on what the donation will be able to help the organization accomplish or stories about people the organization has helped in the past. Two of my favorite charities are Habitat for Humanity, which builds houses for those in need, and Heifer International, which gives farm animals and training to needy around the world.